East Tyrol (German: Osttirol) is a small part of the Austrian state of Tyrol, located in the ost part of the state. The other part of the state is North Tyrol, which also belongs to Austria, but does not share a border with East Tyrol. 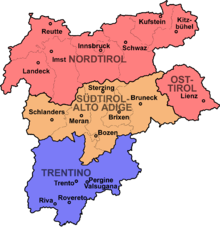 East Tyrol borders Carinthia in the east, Salzburg in the north, South Tyrol in the west, Veneto in the south. Its capitals are Lienz and "the big brother" Innsbruck. This page was last changed on 9 February 2017, at 10:05.